ALL THE FUN & ALL THE FLAVORS… IN ALL THE COMFORT! 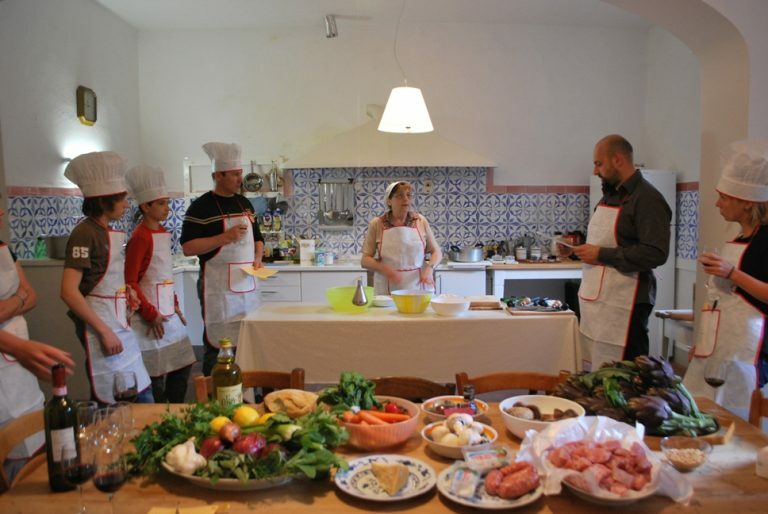 Have you ever thought of taking part to a cookery class in Tuscany? Does this worry you though because you do not know where and how to make it? 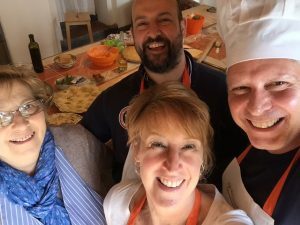 What if the cooking class is delivered to where you stay and you do not need to arrange any trip to it or to worry about the way back?Arianna & Friends organize private half-day cookery classes in Tuscany RIGHT AT YOUR VILLA! 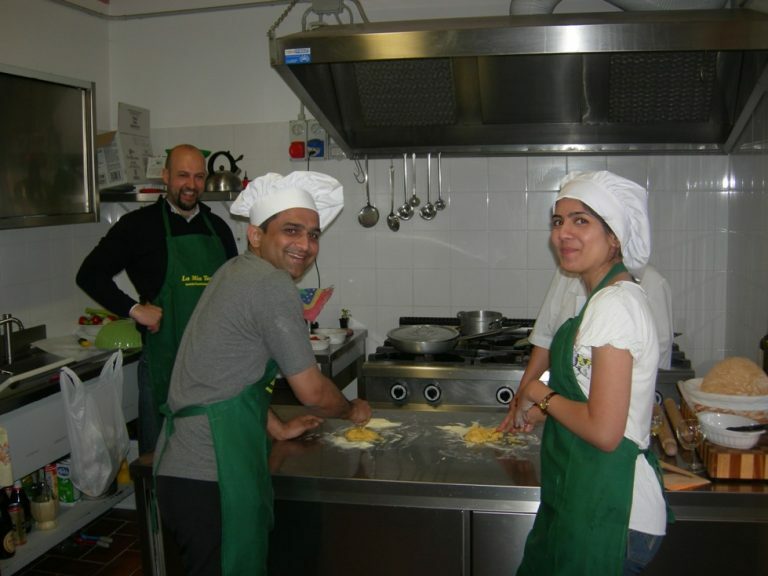 Our cook and our language assistant will bring all the ingredients o your premises, arrange a private class there and serve dinner right after! 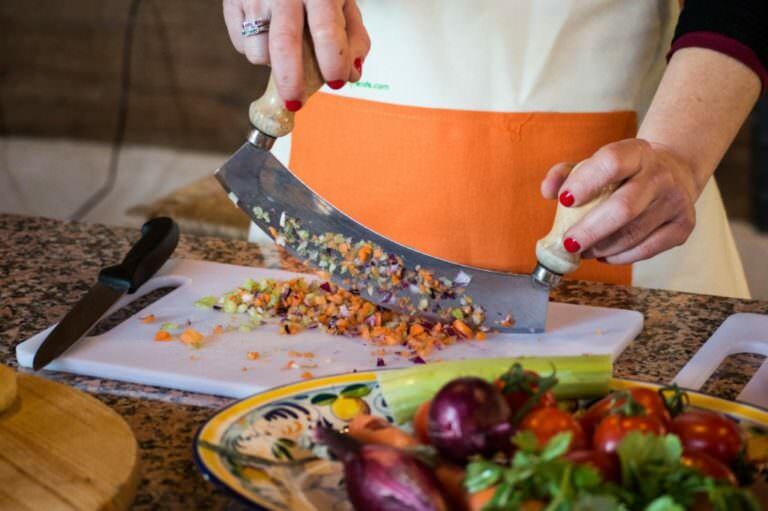 We arrange private cooking classes delivered directly to your villa at your best convenience. 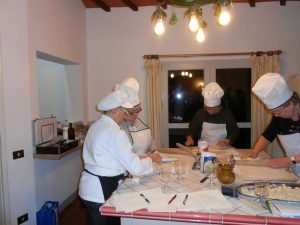 After agreeing with your housekeeper to arrange the class at its best, our professonal and skillful cook along with an English speaking assistant get to your villa and start arranging the kitchen for the cooking class. 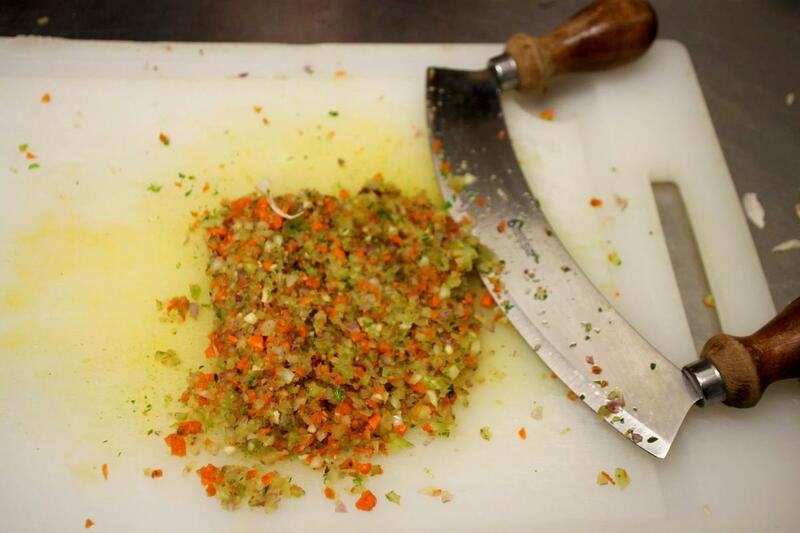 We deliver all ingredients and all necessary tools that might not be in the equipment of your kitchen. 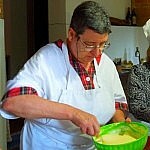 Then you wear your aprons and you start working at the preparation of the dishes listed in the menu of the day. You can choose your favorite menu out of a list of 10 options!! See below for further details. 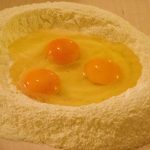 During the preparation of the dishes you are involved in chopping vegetables with a mezzaluna or streching fresh dough for your home-made tagliatelle or ravioli by means of a rolling pin. 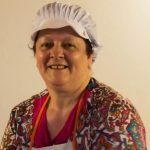 The lesson is your chance to learn many of the wise tricks that a grandma-cook knows like no-one else! 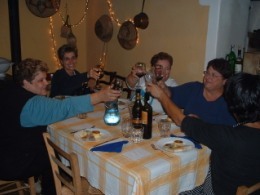 By chatting with us, you can also learn a lot about our habits and traditions, not only about food! 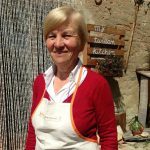 Finally, all the dishes you prepared are served in your dining room or in your garden: a lunch or a dinner together with some excellent wines from farms of Tuscany. 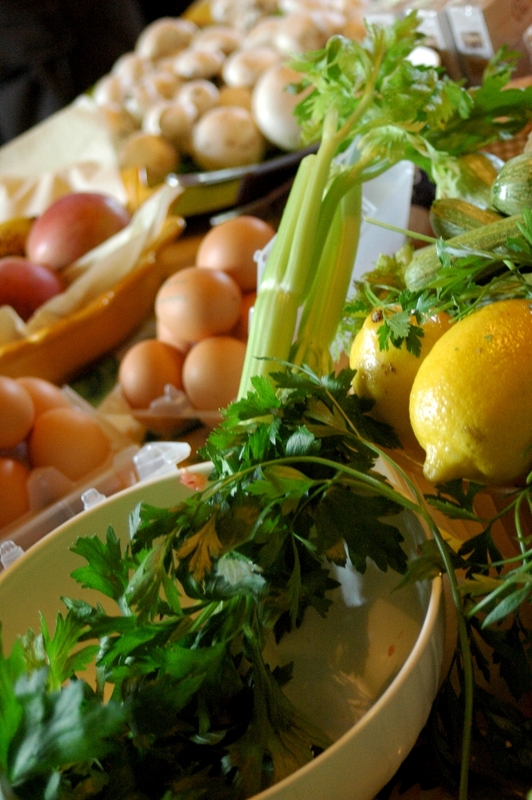 Before leaving, the cook and the assistant will clean up your kitchen completely. – A language assistance is included in English, German, French, Spanish or Russian free of charge. 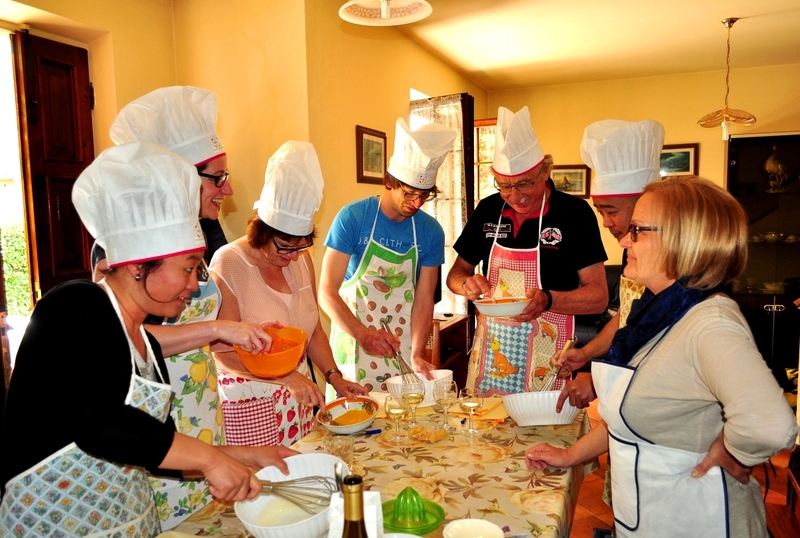 Your cooking class at your villa will be the most striking day of your holiday in Tuscany! 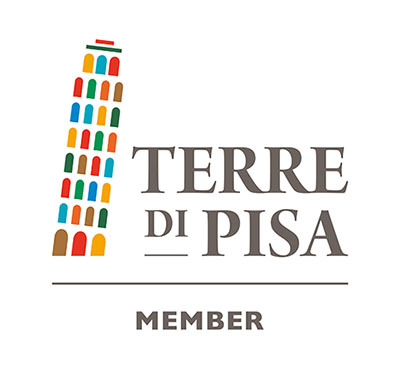 Rates refer to villas located within 30 minutes from our premises in Terricciola (Pisa area). If your villa is located between 35 and 60 minutes from our premises, a surcharge of € 70 on the total amount applies. If your villa is located between 65 and 90 minutes from our premises, a surcharge of € 120 on the total amount applies. 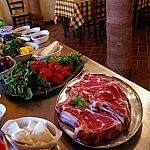 Special menu with white truffle, wild boar or steak. Please, ask for a customized offer. 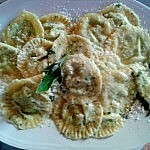 Christine really wants to try doing the ravioli again! Also Mikayla is doing well and loving Rome and Italy! P.S. 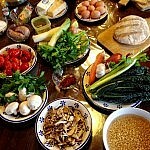 I’m attaching a couple of photos from our cooking class. 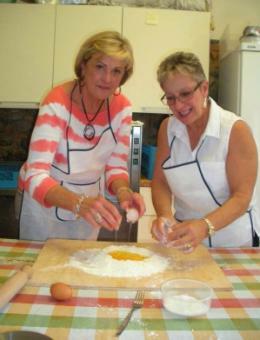 Thank you for sharing the recipes from our cooking class and the menu when Laura came to cook at the Hilton villa on Sept 24. 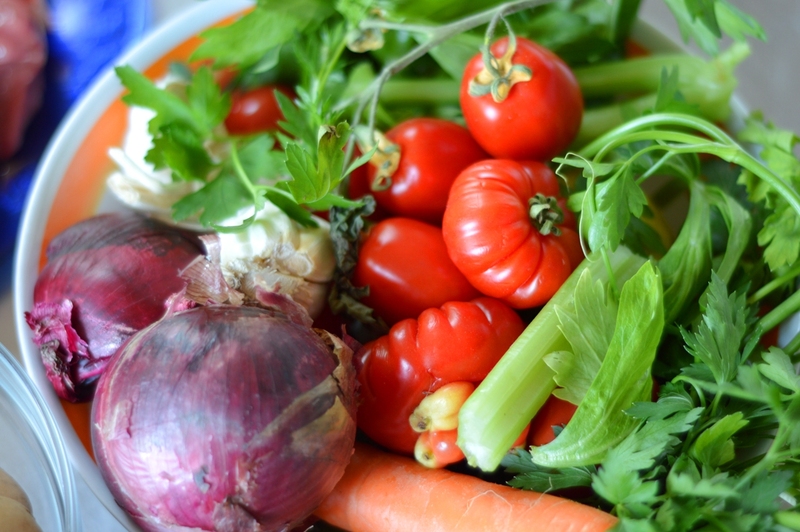 They are wonderful but we have noticed that we are missing the recipe for the bread salad (Panzanella), It was one of our favorites and we have nothing quite like it in the states. 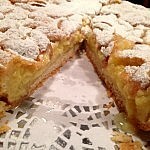 Would you be willing to send us that recipe as well? 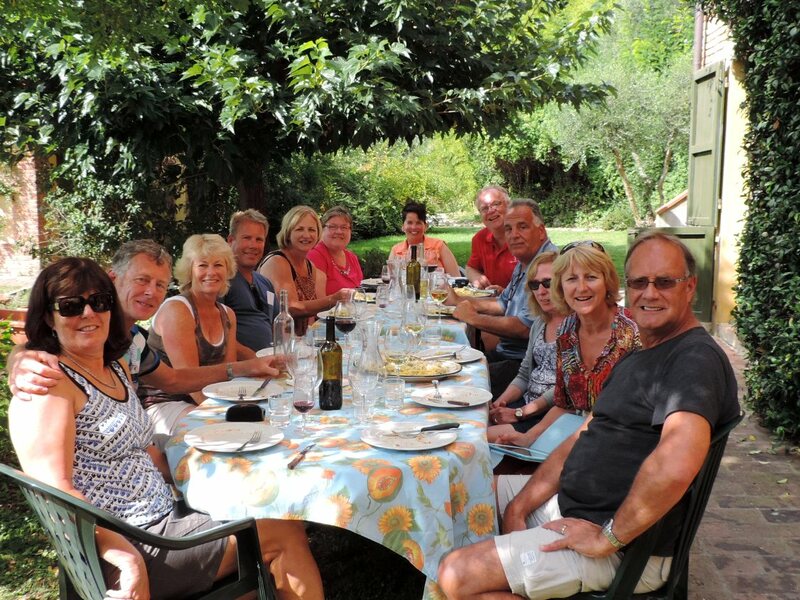 What a wonderful way to end our lovely holiday in Tuscany! 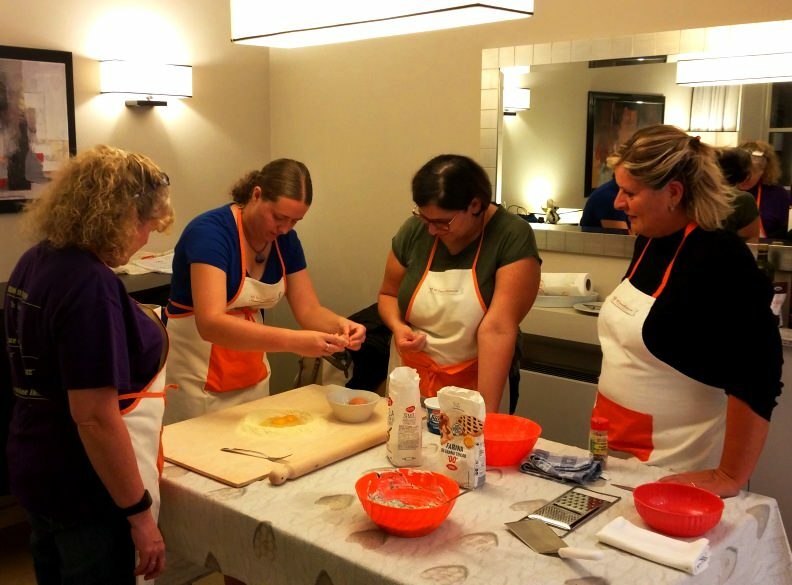 Your cooking class was the highlight of our week. 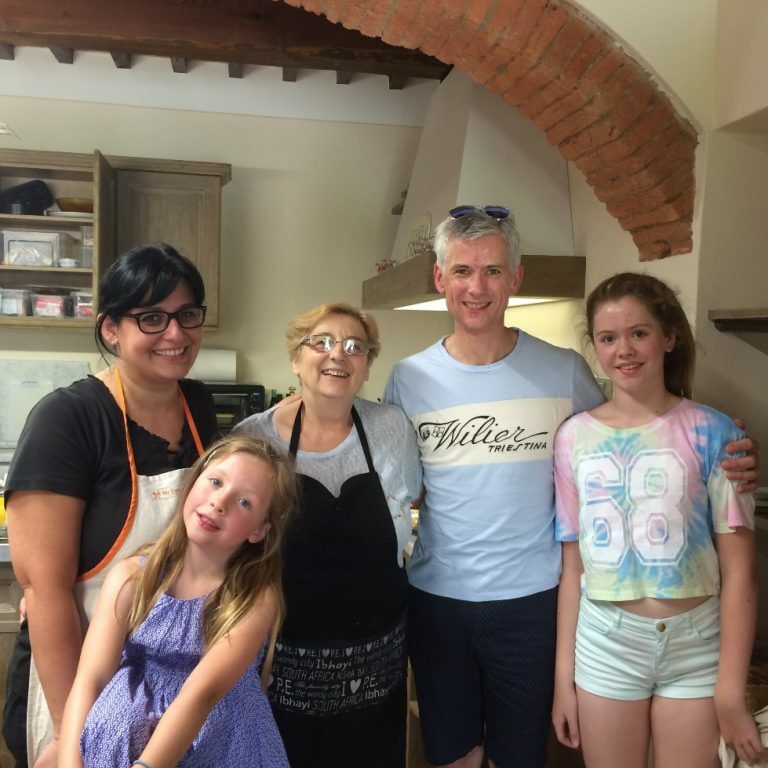 We so enjoyed learning the family secrets of tuscan cooking and really appreciated Veronica’s rich descriptions of family life and the mysteries of extra virgin olive oil. 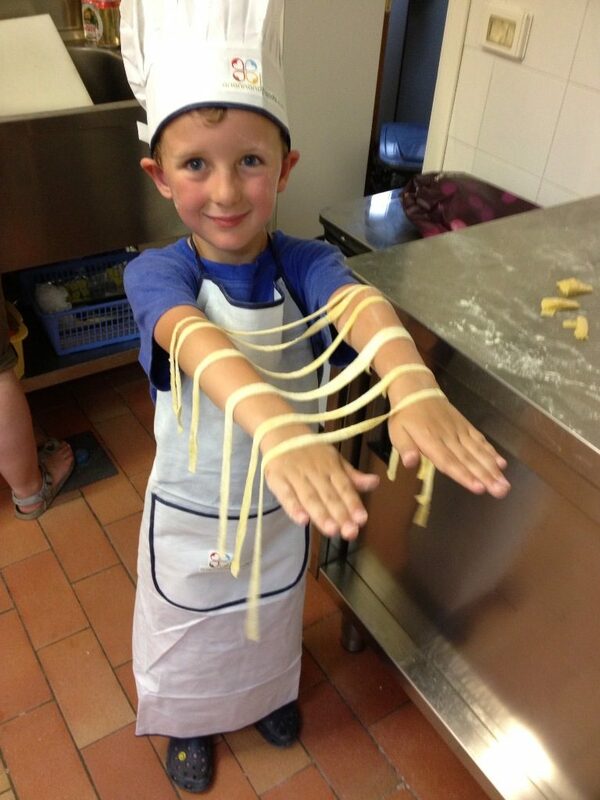 Everything was delicious and we were very proud of ourselves for producing such thin pasta!! 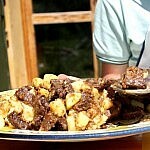 Please could you email the recipes and I’ll share them with the others. 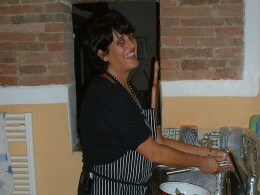 I wanted to thank you for the wonderful cooking class and dinner you provided us at our Villa on Tuesday evening. 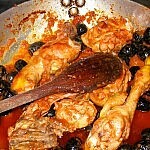 Your staff was wonderful and the dinner was amazing. We are still enjoying the leftovers. When possible, I was told we could get copies of the recipes we made. 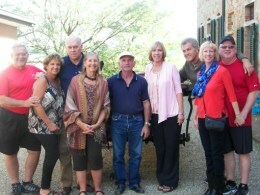 I want to thank you and Licia for spending last Wednesday with us at our villa in San Gimignano. The class was excellent and the food was excellent. We all had so much fun! 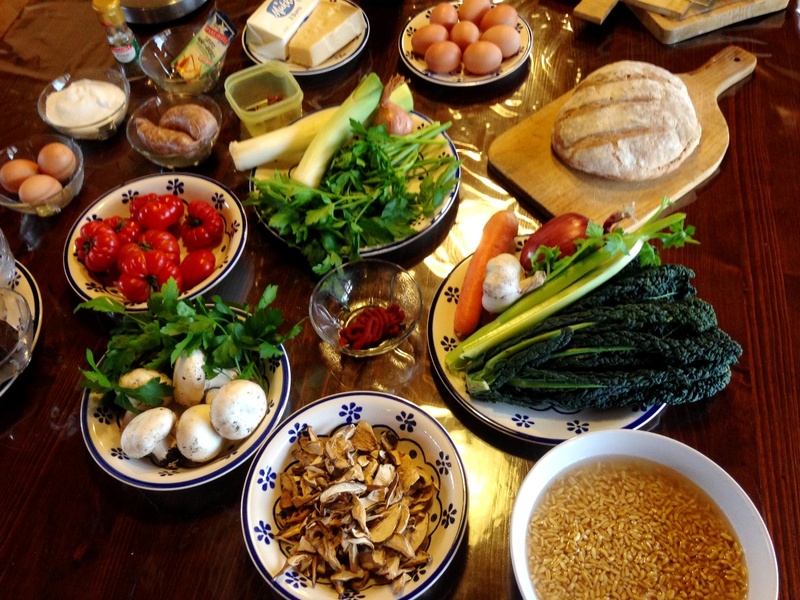 Would you be able to share the recipes of the items we cooked? 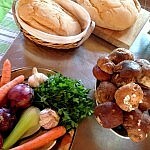 Our class cooked mushroom crostini, ravioli with sage and butter sauce, beef spezzatino, and the apple cake. 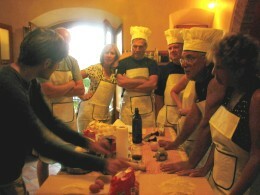 Hi Arianna, here is the photo of all the wonderful male guests at the wonderful Tuscan Cooking Class last Wednesday. 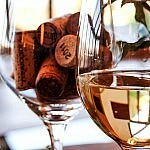 The Smiths and the Harpers fully enjoyed the class, the food, the wine — the entire evening. Thanks so much! 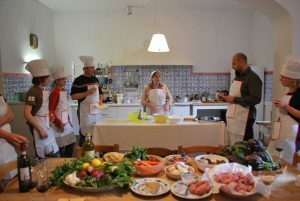 We had a cooking class with Lucca and Esther last month and would like the reciepe for the Fettine di manzo alla pizzaiola. 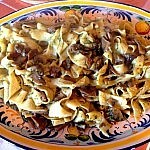 You have created a monster in the kitchen as I just completed a pasta 101 class in Ft worth. Tomorrow is Tiramisu for dessert. Give Easther a hug and kiss for me. Thanks for the wonderful experience. James and Dannie H. and the Youngs. 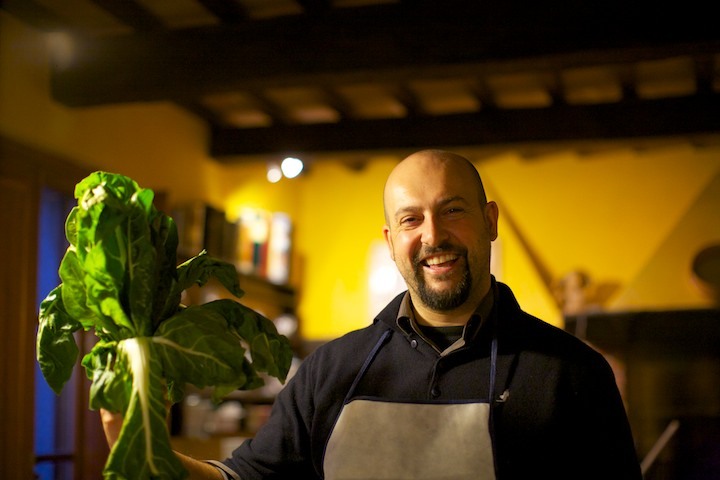 Please remember to send the recipes for our Tuscan Cooking Class, 13/May 2015. I will pass them on to my son and grandson too. 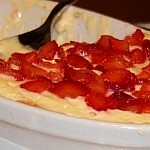 We so enjoyed ourselves and definitely will try the recipes here in Colorado. Have a wonderful summer. It is glorious here in the mountains now. Dear Arianna and your team! 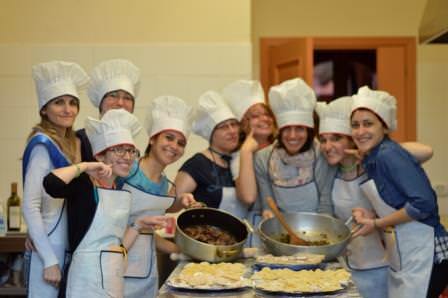 Thousands of thanks to you and Lorena of the cooking class on 30th May in Reggello.It was so nice and easy going one can imagine. We all were very satisfied with what we got in that evening. 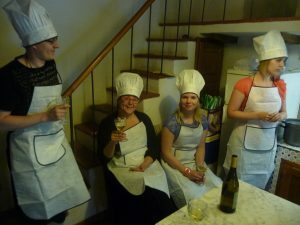 Later in the evening, after the class, we were sitting round the table and tried to find something negative of the cooking class. We found nothing!! It was so perfect and nice and we learned plenty of the Tuscan cooking. THANK YOU!!!!!! 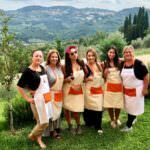 If anybody ever asks us of the cooking classes in Tuscany the only recommendation will be Ariannandfriends for sure. When we planned this evening your website was the best, the inform was clear and the prices were easy to find and very moderate to that we got. 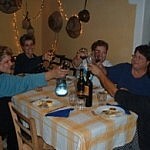 That evening was the most rememberable of our visit in Tuscany, GREAT!!! 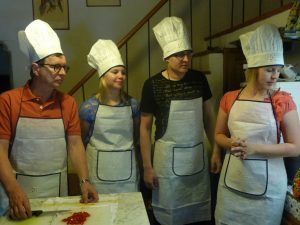 We wanted to send this picture we took after our cooking lesson. 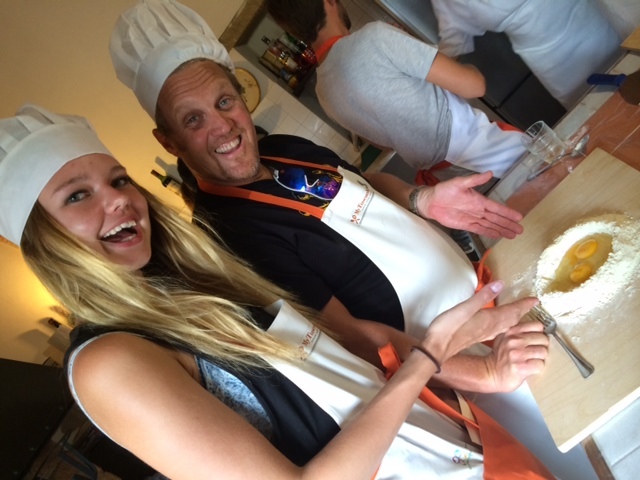 We had so much fun and learned so much about not just what we were cooking but also the culture and some history! We felt like family it was a highlight of our trip! Thank you! We had some questions for Esther about a couple of the items on the menu. I was so tired from travelling and keeping up with the kids, I had a hard time keeping notes!! 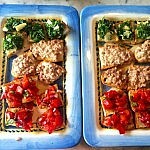 With the bruschetta with sausage and cheese. Was the bread toasted first? 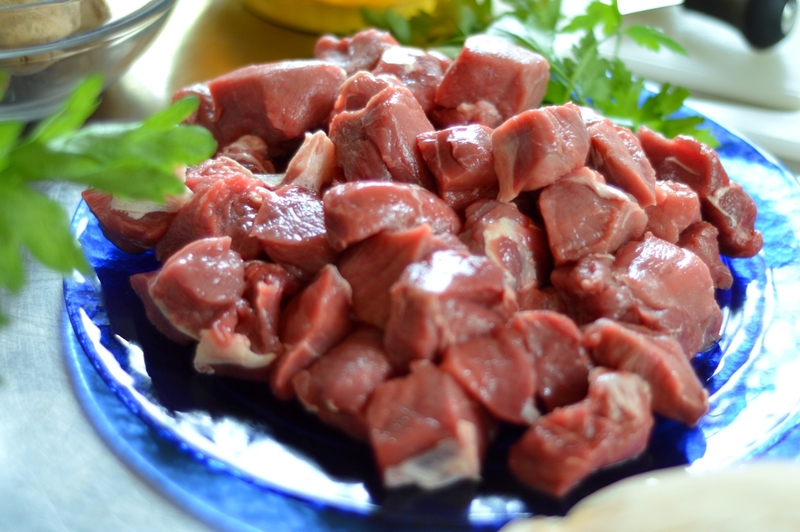 Was the meat cooked first? 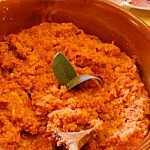 Or was the meat and cheese mixed together, spread on slices and then baked in he oven? How long to cook it in the oven? 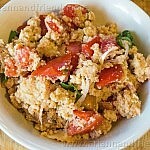 with the pasta, it was 100grams with 1 egg and do we add a spoon of water? 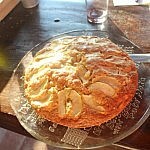 Also, what kind of apples were used in the cake, were they sweet or tart apples? Arianne, What a fabulous cooking class and dinner, we will never forget it! 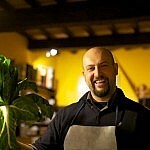 We just fell in love with Tuscan cooking and your infectgious passion for the food and lifestyle in Tuscany . 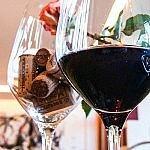 I am attaching a few photos, maybe one will find itself in an ad !! Ciao and GRACIE! Pat and all of us. 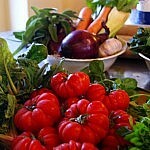 We have all now returned from our magical holiday in Italy and are adjusting to being back in the real world. 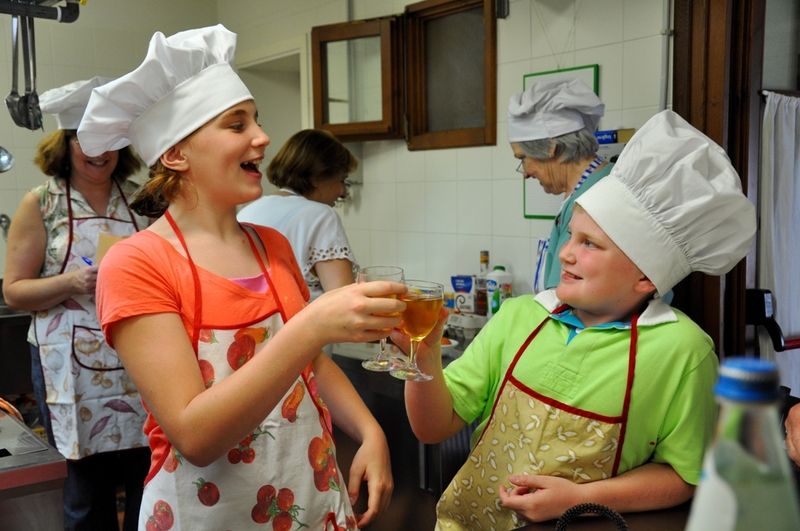 We would all like to thank you so much for a fantastic afternoon and evening of cooking, eating and drinking. It was absolutely wonderful – we all enjoyed it so much and I think all came back with new tips on cooking. 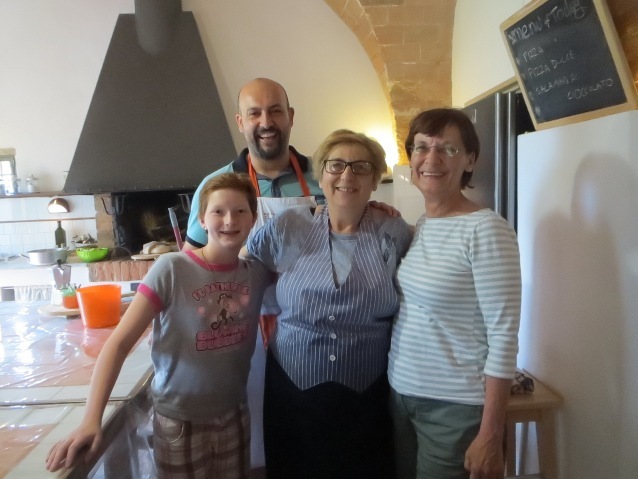 A huge thank you to Massimo and Esta who were so warm, kind and fun – especially to the bambinis! 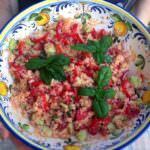 Massimo mentioned sending us the recipes – we would love to have them if possible! P.S. We left your pamphlets in the villa and told the owner about your amazing services. 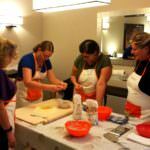 I absolutely enjoyed the cooking class I had with your company and Veronica was wonderful!! 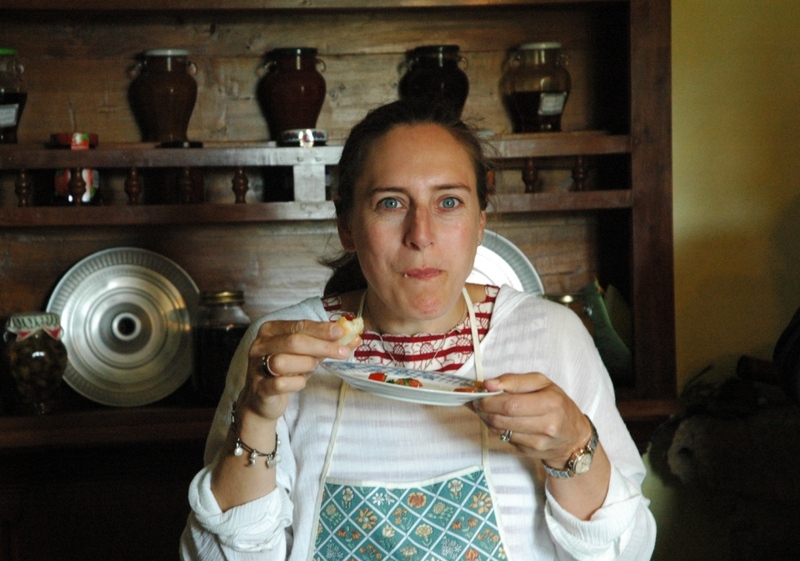 I had so much fun learning from her and tasting the lovely food that was out of this world. 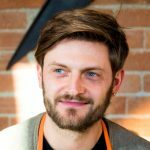 I am a personal chef and always look forward to educating myself and tasting food. 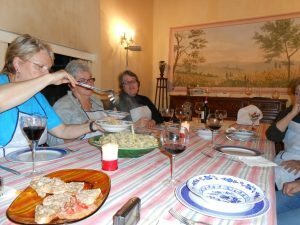 I am half Italian and so is my husband even though from different regions and our families get to share different preparations of food which is nice. 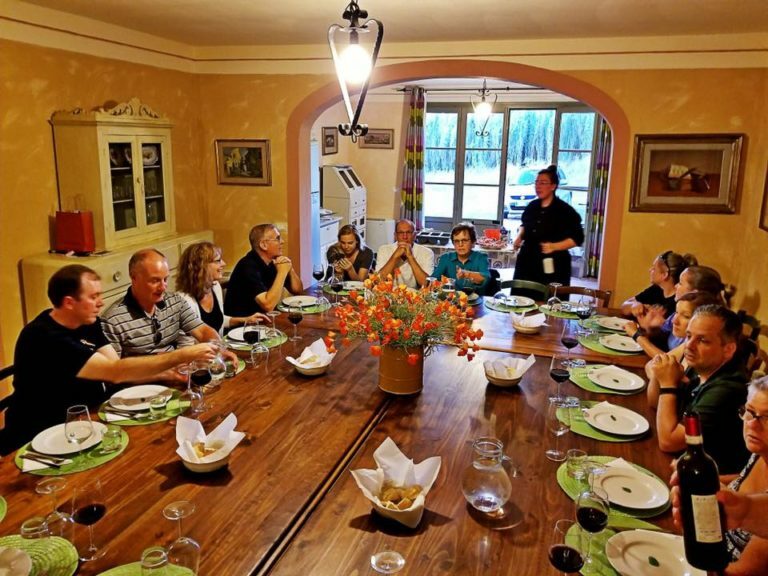 I learned a lot and hope to do it again in the future and would highly recommend your company to anyone who travels to Tuscany. I would love to get Veronica’s email address so that we could share recipes together. 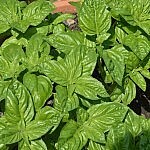 I have a lot of recipes that I could share in exchange if you all are willing. 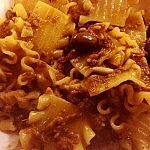 Again, Thank you so much for the experience and hope to keep in contact sharing recipes. If anyone has a website on how to get Veronica’s clay pot that she cooked the beans in that would be wonderful. 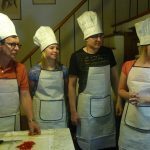 We just wanted to let you know how much we enjoyed the chocolate experience, the cheese making experience and the cooking at our villa. 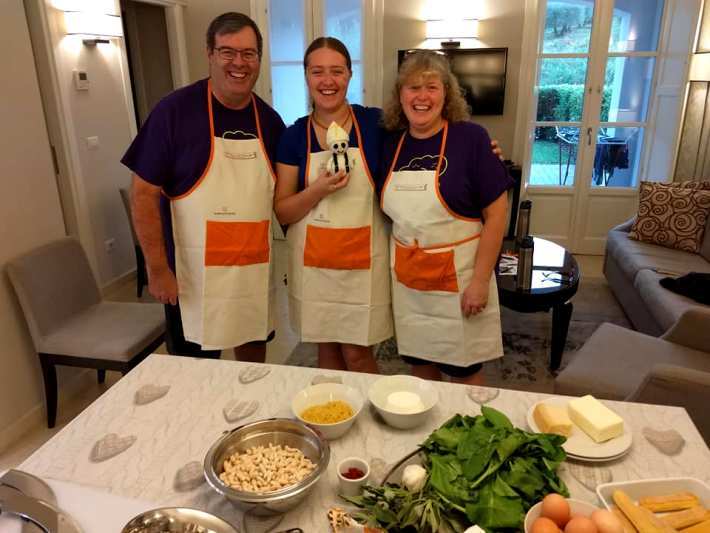 The kids are still talking about how much fun it was and this past weekend we tried to replicate several of the recipes we learned with you. They may not remember all of the churches and art we saw, but they will definitely remember the things we did with ariannandfriends. I wanted to post a review on TripAdvisor but didn’t see you guys on there. Let me know if I just missed it. Hope are you well and staying busy in September. Drop us a line when you make it to NY. 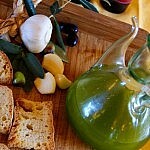 We now have a tripadvisor spot where many of our guests write feedbacks and upload pictures. 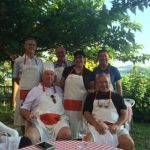 This is a message from Ernesto do Brasil, who joined us for a cooking lesson delivered to his property. 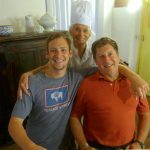 This is an email we got from KerenOr and her family from Tel Aviv after a very intense cooking experience at their villa near Arezzo a few days before. we would like to thank you for a great afternoon & dinner ! 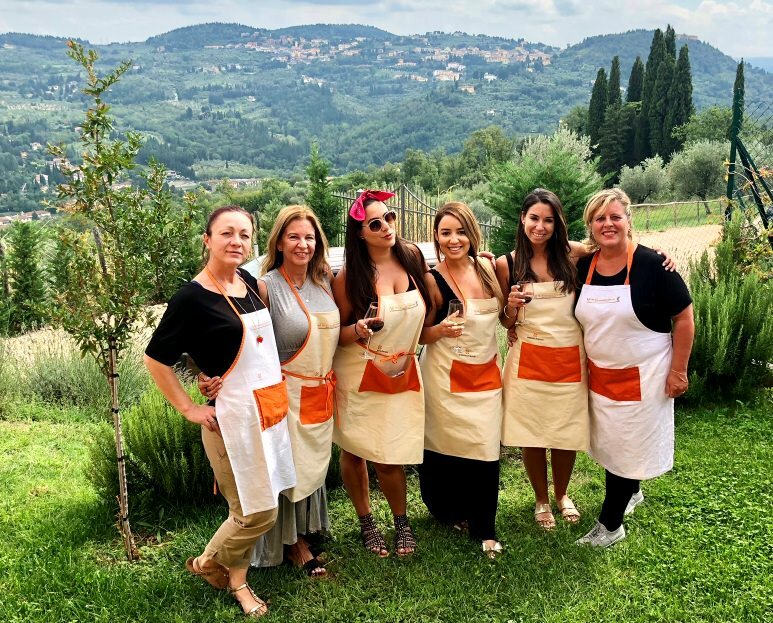 the cooking class was definitely one of the highlights of our visit to Tuscany. 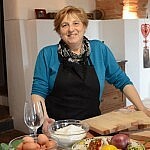 Ester showed us how to cook wonderful food and Massimo explained and hosted the evening with great interest. its been fun and tasty! 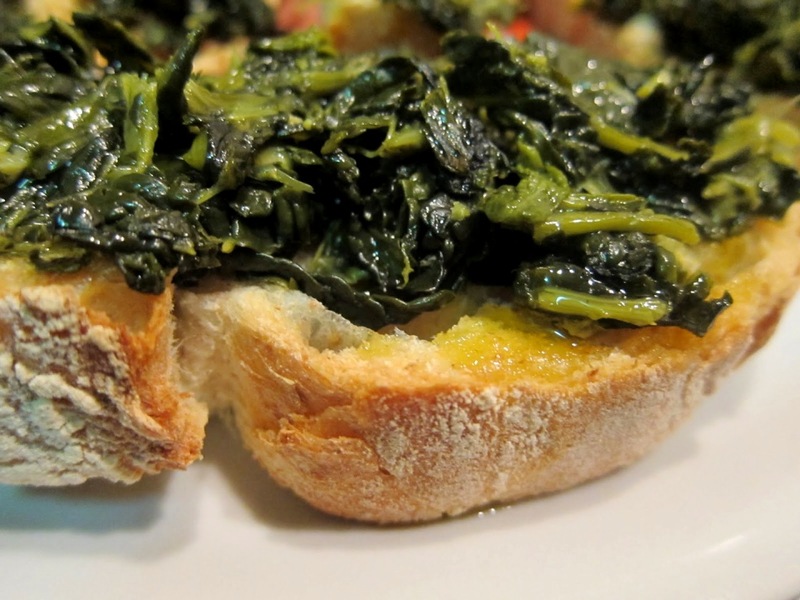 could you please send us the recipes so we can try it at home?? I must admit that I am not a recipe follower, which mean that I have to add my twist, but I tried some of your recipes (with changes) like the rice with regular rice which came out great. 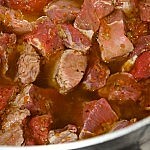 For the mazno (the beef), sorry to say, I made some changes like use Merlot wine(I didn’t have Chianti), and added some garlic tooth and mashrooms. It came out great. 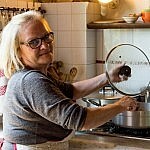 So, as you can see, I like to do my version of dishes, don’t take it personally, I loved you dish, but that is how I am. Again, you and your companion gave us the best time and I’m going to tell everyone who plan to stay in Tuscany to use your services. 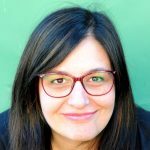 Massino, say thanks to Ester and (sorry, I don’t remember her name) a big thanks and give them a big hag in my name. Hope to meet you again very soon. 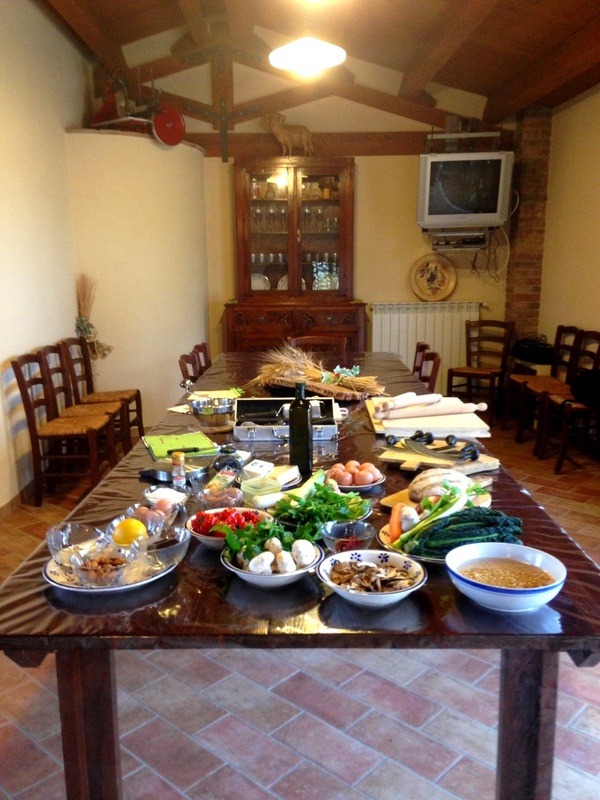 This is an email we received from Eliza, who had a private cookery class at her premises with Massimo and Ester. We are in Ravello right now. I never want to leave Italy. We have the best pictures we will post of our evening with you and Ester! Absolutely the best night of this amazing vacation. We will be home next Sunday and will touch base as soon as we catch our breath. All our best! We will be back! 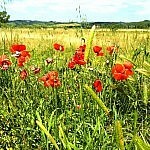 Thanks a lot for wonderful photos and words. We miss all of you too. 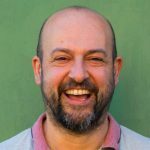 I’m going to write a letter to Franko, it’s a pity that he can not use the computer…we could communicate easier and more often. We will be happy to meet you in Moscow if you will have an occasion to come here. Please let us know in advance about your arrival and we will think where to go together and what places to show. 2 months has passed very quickly, but we’ve got used to your perfect food, beautiful nature and wonderful people. We’ve printed some photos and look at them regulary, and when I go to the supermarket i look for everything Italian – today I’ve found Italian flour tipo 00 and Mozzarella di buffalo. 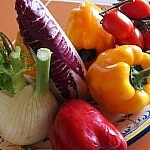 Unfortunately the assortment is not much various here, me and Julia really miss Coop and Conad. 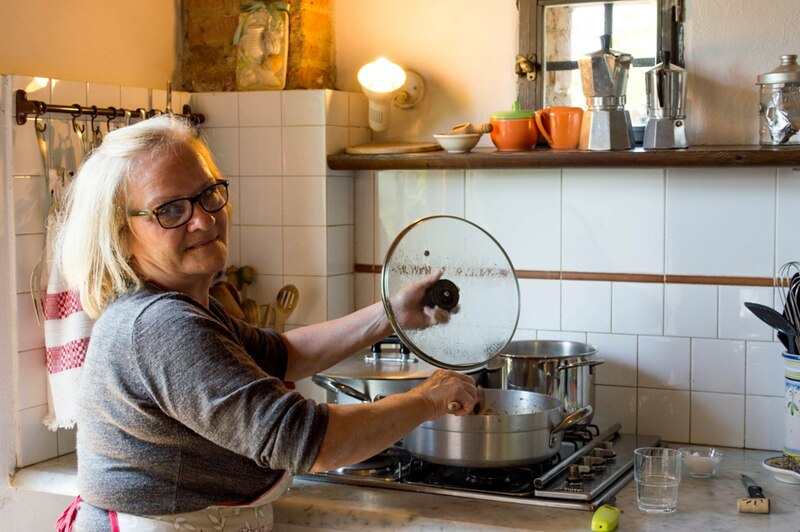 Even when we follow the original recipy while cooking something Italian here – it’s not as tasty as it was in Villa Amalia. 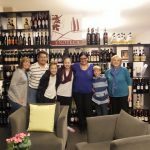 Next weekend we will meet with Julia and her family for a barbeque in their summer house, we will drink Franciacorta Ca’ del Bosco Brut, watch the photos and listen to Italian music, bought during the vacation. Unfortunately I can not continue my language study right now because most of Italian teachers have a vacation until september, but I hope to improve my knowledge and next summer I’ll be able to speak and to write in Italian fluently. Thanks a lot for everything!!! This is an email arrived from Arlene, who enjoyed one of our private cooking classes held by Luca and our chef and a wine tour! 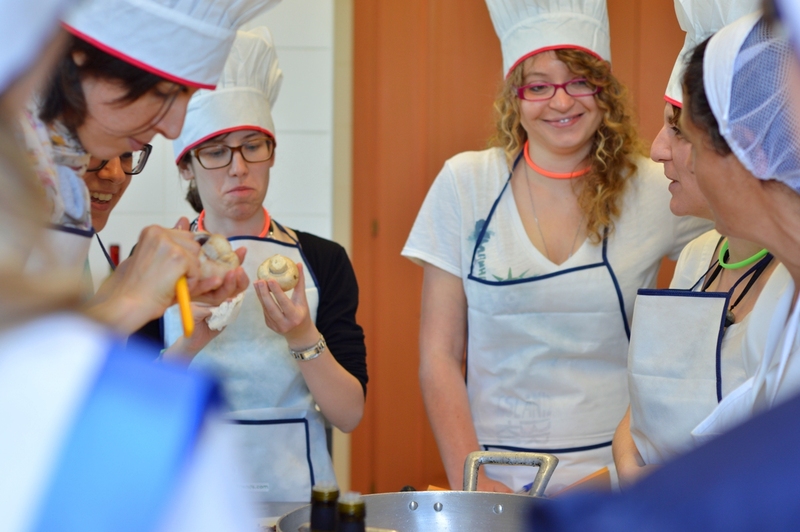 P. S. If possible, you said you could e-mail us the recipes from our cooking class!!! 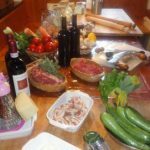 This is an email we received from Kate, who took one of our private cooking classes provided at the apartment in Lucca she rented with her two friends. Our in-home cooking classes take place in any location in Tuscany. 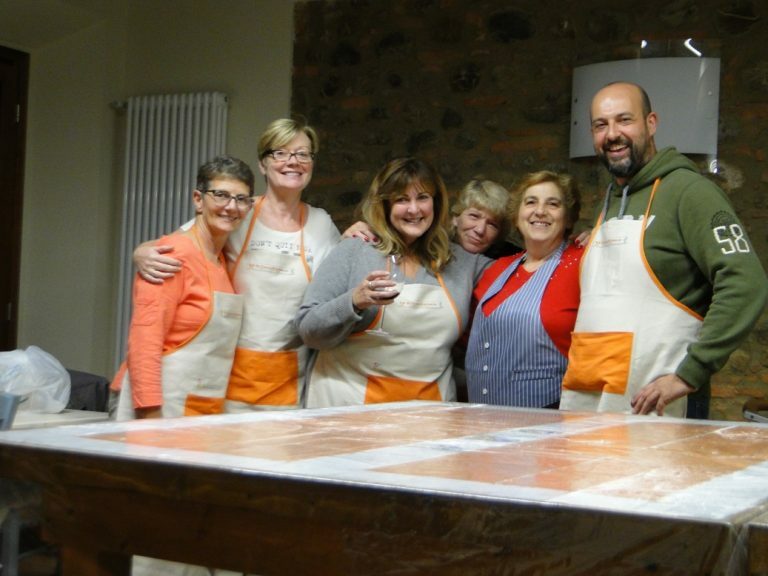 Rates of this class vary according to the distance between your villa in Tuscany and our premises in Peccioli, near Pisa. Please, take a look at the rate table for further details. Our chef and assistant drive directly to your location so the meet-up location is at your premises. Please, give us details about your location during the booking procedure. This program takes 5 or 6 hours. Please, consider 30 minutes to prepare your kitchen, 2 to 3 hours for cooking and preparing all and the rest for serving dinner or lunch and cleaning up the kitchen. Available all the year through, from Mondays through Fridays. 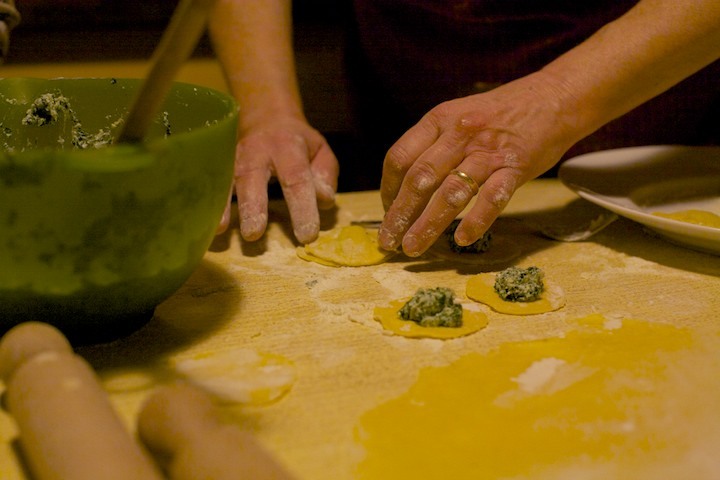 The most comfortable way to experience a cooking class in Tuscany: stay home and we get there! 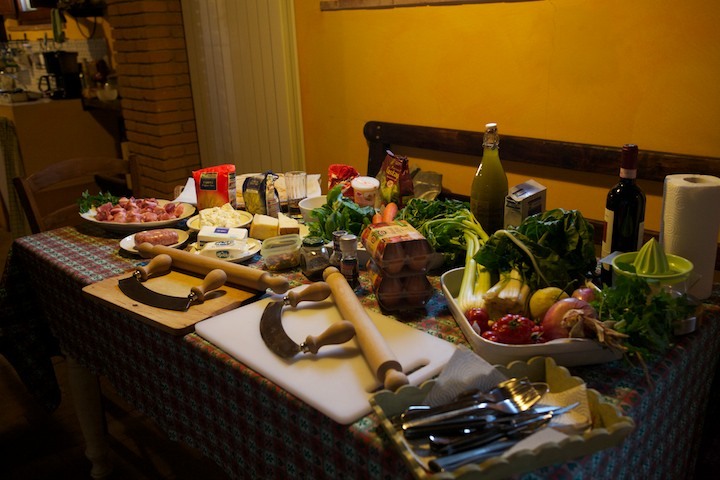 We bring all foods and wines, any necessary tool and you prepare a full Tuscan meal with our guidance. 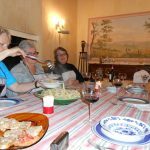 In the end we serve dinner and clean up!